Plans to build an entired fleet of boats to play with on the carpet or in the water. Made mostly from 3/4" stock. 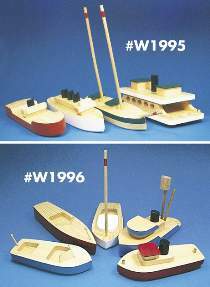 Plan #W1995 includes FULL SIZE patterns for four different boats - a ferry, ocean liner, freighter, and schooner. Plan #W1996 includes FULL SIZE patterns for five different boats - a tugboat, sailboat, fishing boat and two speedboats. The #W1999 Boat Plans Special includes both plans.